Is Abbas Still Relevant to the Peace Process? If the 300,000 West Bank settlers identified by the U.S. President as an obstacle to Middle East peace were expecting Bibi Netanyahu to support their cherished dream of an Israel stretching from the Jordan to the Mediterranean Sea, they were disappointed on Sunday night. The right-wing leader instead took a sharp and unexpected lurch to the center and said he would support a two-state solution, meaning something called Palestine is a step closer to being inked onto their 3,000-year-old biblical map. To his credit, clench-jawed Netanyahu could have used the re-election of Israel's favorite bogeyman, Mahmoud Ahmadinejad, in Iran to raise the usual security alarms and resort to time-tested fear-mongering. But in his speech, he mentioned Iran only briefly. In the Middle East, change is measured in centuries, and dusty diplomatic phrases from talks 10 and 15 years back remain verbal screens for inaction long after the hopes they represent have been abandoned and the men who crafted them have retired to Cambridge and Palo Alto. For a hawk like Netanyahu to plainly say he supports a separate Palestine has the potential to redraw the political map, if not the geographical one. On the other hand, the Israeli Prime Minister and everyone else in his country know that the Palestinian territory available for any second state is now so jigsawed up with armed Jewish settlements, checkpoints and exclusionary bypass roads that it would require the deranged precision of an obsessive-compulsive cartographer with Asperger's syndrome to sort out what author Gershom Gorenberg has called an "artificially created Bosnia." For the right, the speech could have been much worse. Ever since U.S. President Barack Obama told the Israelis to freeze the settlements  and meant it, as opposed to previous U.S. Administrations that barked but never bit on that subject  the right has been worried that Netanyahu might cave. In fact, Netanyahu left himself familiar wiggle room on settlements too, saying the Israeli government would freeze settlements but allow room for natural growth (translation: ultra-religious families of eight should not feel the need to restrain their rate of reproduction). The freeze talk has historically been meaningless blather in Israel. The government "froze" the settlements in 2003 but has surreptitiously supported building through a network of agencies, so building approval increased at a rate of 40% between 2007 and 2008 alone, according to Yesh Din, an Israeli organization suing to stop outpost settlements. So much building has happened since the mid-1990s that the West Bank resembles a Jackson Pollock drip painting of Jewish and Arab lands, connected and disconnected by bypass roads and cement blocks. The old Green Line border, now morphing into a wall, has literally doubled in size to account for myriad new thrusts into, twists around and enclosures of Arab lands. Just so you don't get too much of your hopes up, Netanyahu's support of a two-state solution comes with conditions that Palestinians have never accepted before and have shown no signs of accepting now. He plainly urged the Palestinians to accept Israel. "We need courage and sincerity not only on the Israeli side: we need the Palestinian leadership to rise and say, simply, 'We have had enough of this conflict. We recognize the right of the Jewish people to a state its own in this land. We will live side by side in true peace.' "
He also explicitly denied Palestinians their greatest dream: the right of some 5 million Palestinian refugees to return to what is now Israel. "Justice and logic dictates that the problem of the Palestinian refugees must be solved outside the borders of the state of Israel. There is broad national agreement on this," he said to thunderous applause from a stage at Bar Ilan University. He also reiterated Israel's intention to keep a grip on Jerusalem, which Palestinians also want as their capital. The Palestinian reaction was unsurprising. Said Palestinian chief negotiator Saib Arekat: "In a thousand years, no Palestinian leader will accept this." In the hours after the speech, the right called Netanyahu's acceptance of a two-state solution a sign of Bibi's Obama-ization. 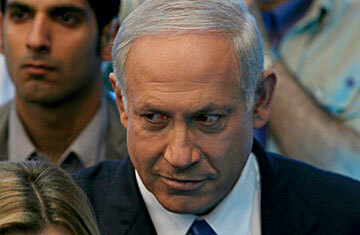 "It was a brilliant speech, but Netanyahu surrendered to American pressure. We will act with all our power against a Palestinian state," said Dany Danon, a Likud party leader. The hard-line Prime Minister didn't seem eager to deny his common ground with Obama. "I share the President of the U.S.A.'s desire to bring about a new era of reconciliation in our region," Netanyahu said. In the extreme outposts where only generators keep the black desert night at bay, settlers who don't watch much television inside their spare trailers will be digesting the bad news over the next hours and days. Netanyahu will have them to contend with beginning Monday.